Sandra Webster, co-spokesperson of the Scottish Socialist Party recently wrote an article in her personal blog outlining the reasons why she wants to Scrap Trident. We are re-posting the article below but, if you want to see the original, have a look ‘here’. I live in Paisley, on the other side of the water from Faslane. It’s a short but steep walk up to Robertson Car Park, or the car-park in the sky, as it is known to generations of Paisley Buddies and incomers like me. It is worth it for the view alone. The whole of the Clyde valley unfolds below you; the countryside full of little towns, hills and rivers. Beautiful! From here I can see right over to Helensburgh and even get a fleeting glimpse of the Naval Base at Faslane – most of it is out of view, however. After all, it is Top Secret! Despite now living on the West Coast, I had not visited Faslane or the Peace Camp until last year, I am ashamed to admit. I had always tooted my horn in support when I passed by and followed the blockade and actions on the news. Although, of course, these are not always covered by the media. Last year, a friend, Neil, arranged a visit to the Peace Camp along with some of my comrades from Campsie Branch. It was an eye opener, and a day on which I learned so much about direct action, lock-ons and how a protest, even outside the gates of hell, can be peaceful and non violent. Why shouldn’t those who believe in Peace not show that there is a different way to behave? Seeing this, I was moved to think about my politics and how I conduct myself in the personal and the body politic. Over the past year, I have shared at public meetings how this visit has changed me, and why I am passionate about getting rid of Trident as soon as possible – and definitely intend to do so in an independent Scotland. I will be there at the gates of the base, the morning after the YES vote, with as any people a possible giving them notice to quit immediately – not waiting a couple of years until the treaties are ratified. These weapons of mass destruction should not be tolerated so close to where people live and work. They are not safe in Coulport, Faslane, or anywhere else in the world. I look forward to the day the people of Scotland vote for an Independent Scotland, but I want change now. Just imagine how perfectly we, as a nation, can demonstrate our intent about the type of nation we are going to be if we could step into the glare of the world stage unfettered by the threat to ourselves and others of weapons of mass destruction, which need only be used once to destroy our whole world. I’m a socialist, a member of the Scottish Socialist Party, and I believe passionately in social justice for all. After getting rid of nuclear weapons I would like to see an end to child poverty, the repeal of the anxiety-causing bedroom tax, and, instead, see a nation where we all take care of one another. A nation where we are not divided into strivers and skivers, but where all our worth is recognised. I think the people of Scotland, if asked, have great ideas about how the hundreds of millions of pounds wasted on Trident could be used for the common good; on services such as free education, and better schools and health facilities. Perhaps we should get together and write up a wish list and present it to the Westminster and Scottish governments. I am also a carer, and I can see for myself how the cuts to local services are wreaking havoc on families’ ability to care for their loved ones. These hated and callous austerity measures mean that more and more loving families will reach breaking point and be unable to cope, with the result that more people will have to go into care. It is happening already and I fear it is just going to get worse. Finally, I am also a mum. Like all parents, I love my children and want them to grow up in confidence and security. I was a child in the eighties, and remember the nights I spent lying awake worrying that a nuclear war was going to be unleashed. I would not wish for this sort of anxiety to cloud anyone else’s childhood. I just want my children, and yours, to grow up in the sun – not even knowing what these evil inventions are. I want them to live in a world where the billions of pounds spent on weapons is put to better use. Nuclear weapons are dangerous and unpredictable. Having them threatens all of our lives, daily. Nuclear fallout respects no borders. It will travel all over the world, wherever the wind may blow it, poisoning the atmosphere and causing unknown damage to the unborn. I can still remember the alarm bells of Hunterston B Power Station ringing when the radiation of Chernobyl, thousands of miles away, reached the west coast of Scotland. I saw, yesterday, on the front cover of the usual suspect, The Daily Mail, that Gideon Osborne was considering selling off the government shares in RBS and sharing the money out to all UK taxpayers. It was estimated that each of us would receive £800. Imagine if we could get a share of the cost of Trident and put it all into a pot reserved for social good? As well as securing jobs for those affected by the closure of Faslane, this bounty could transform Scottish society. The above are some of the reasons why I am a member of the Scrap Trident coalition. They are the reasons why I will be marching , along with thousands of other people, to show my opposition to Trident nuclear weapons in April. I hope that you can come too. Let’s show the Scottish Government how we feel about having nuclear weapons on our back door and let’s get rid of this anti-social neighbour once and for all. 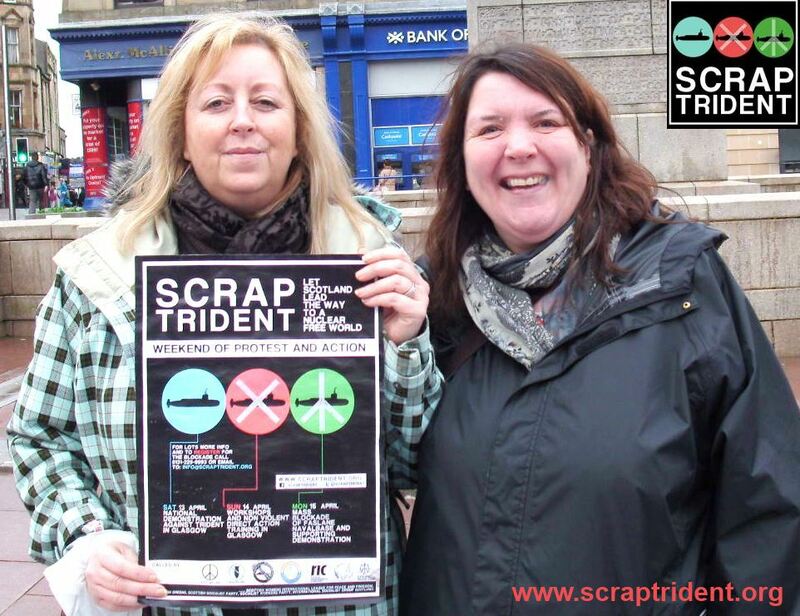 Recently, I had a great day on a stall in Paisley town centre with other Scrap Trident activists, all from different backgrounds, all working together in a common cause. We know that there are many other people who agree with us who could not not be there. We want to reach out to those people. During the event, we were all moved by a white poppy wreath left on the Cenotaph. It was a poignant reminder of all those lost in war – not just the military casualties. The diversity of backgrounds, but each with a common purpose, is reflected in the groups and causes that support the Scrap Trident coalition nationally. I have optimism that together we can see Scotland nuclear free in my lifetime, and that is why I ask you to Scrap Trident. Please go to www.ScrapTrident.org, sign the petition and get involved.